Ross Moorlock: I joined the senior leadership team at Brake, the road safety charity, in September 2017 as Business Development Director and I am project lead for Brake’s Global Fleet Champions campaign; a not-for-profit global campaign to prevent crashes and reduce pollution caused by vehicles used for work purposes. Alongside my responsibilities at Brake, I also sit on the British Standards Institute’s Road Traffic Safety Committee which communicates the UK view into the development of international road safety standards. Prior to joining Brake I spent 10 years working in marketing and business development roles for a large international accountancy firm where I specialised in the not for profit sector. BigChange: How long have you worked with Martin Port & BigChange. 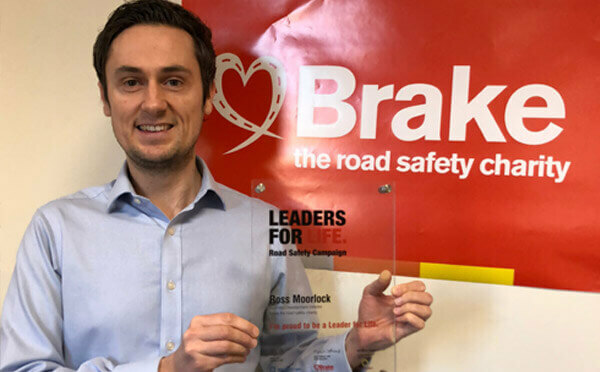 Ross Moorlock: BigChange became a corporate partner at Brake back in 2017 and we were delighted to partner with them to launch their Leaders for Life campaign in September 2018. BigChange: Why are you committed to being a leader for life? Why do you value improving road/driver safety? Ross Moorlock: More than 1.3 million people die on the world’s roads every year. Many road deaths involve a vehicle being driven for work. The safe and sustainable operation of vehicles that move goods or people must be managed by business leaders through risk management and environmental practices. Leaders for Life is a fantastic initiative which helps senior employees to lead by example and promote safe driving behaviour to their employees. Brake is proud to support it. Ross Moorlock: At-work road crashes are a critical, but often unrecognised, safety problem for a lot of organisations. Road safety must be a priority for all employers with at work drivers, whether you’re an organisation managing a large HGV fleet or an SME with employees driving their own car for work. Prioritising the safe and healthy mobility of at-work drivers will also have positive flow-on effects for other road users, their families and communities. I encourage all business leaders to participate in the Leaders for Life campaign. Previous PostBigChange Gives a Lift to Gartec Business PerformanceNext PostHow can the service sectors best prepare for a millennial driven work force?